Effortlessly collect, show and manage customer reviews with the one and only Trustbadge® technology for your WooCommerce store using WooCommerce Germanized! Once integrated, it updates automatically. Additionally you can integrate your trustmark and provide the money-back guarantee. You use WooCommerce, but you don’t use WooCommerce Germanized, which focusses on the German market? In this case, please integrate the Trustbadge by using this manual. If you use the Plugin WooCommerce Germanized by Vendidero, you will find the Trusted Shops configuration in your backend already. There is no further installation needed. Please open your WooCommerce backend, go to Plugins >> Installed Plugins >> WooCommerce Germanized and click on the subsection Trusted Shops options. Please note: If you have already integrated the Trustbadge® manually, please delete it before continuing. Enter your Trusted Shops ID (starting with X...) and save the configuration. You can find your Trusted Shops ID, for example, in your My Trusted Shops Account or in your Welcome-mail. If you like, you may choose whether you want to display the Trustbadge® with or without Review Stars (variant) or adjust the y-axis position of your Trustbadge® (vertical offset). There you are! You have just successfully integrated the Trustbadge®! You can now test the functionality of your Trustbadge® by triggering a test order in your shop. Make sure that the Trustcard appears at the end of the ordering process. The Trustcard contains a button your customers can click on if they want to receive a review request or activate the money-back guarantee. From now on, your customers will be able to activate a guarantee and/or choose to be sent a review request directly after checkout. You can use the Review Collector to invite previous clients to leave a review. If you want to use the Trusted Shops product reviews and you have already bought the corresponding package, activate “Collect product reviews”. 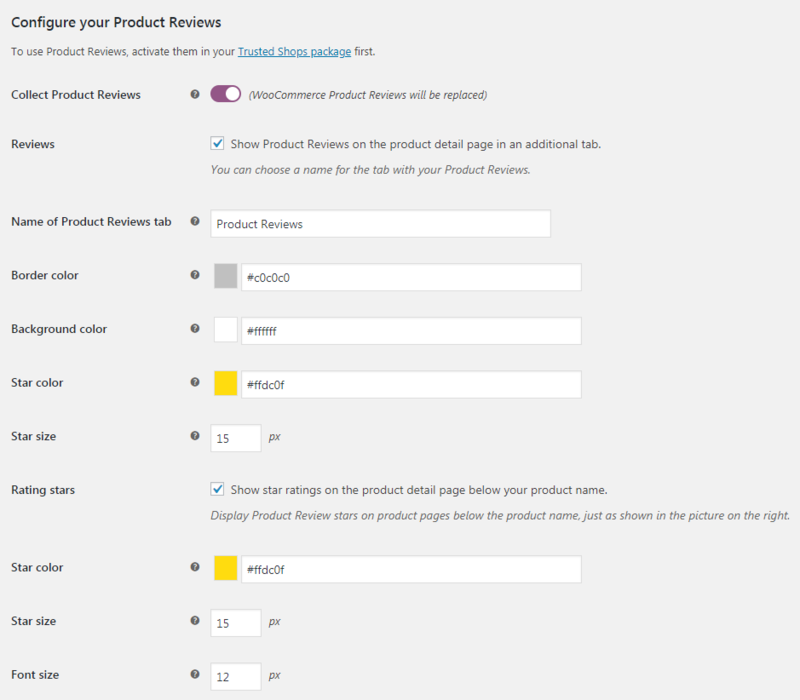 You can adjust the display of the product reviews to the design of your shop using additional parameters. You can set the border colour around the reviews as well as the colour and size of the stars. If you want to show your product reviews in Google Shopping, you can assign the attribute, which should be used as the parameter “brand” here. You can find the other parameters which are relevant for Google Shopping Integration in your WooCommerce backend, directly where you edit your products. The Shop Review Sticker enables you to display shop reviews as a note in your WooCommerce shop without the trustmark. Since shop reviews are user-generated content, the sticker contributes to optimising your shop for search engines. It can be adapted to the design of your online shop by defining the following parameters. You can change the background colour and the font of the Shop Review Sticker. You can also choose the number of reviews that should alternate in the sticker (recommended number: 5) and their minimum rating (recommended rating: 3). Don’t forget to activate Rich Snippets to enable Google to show your shop reviews in organic search results. If you activate Rich Snippets, they will be integrated into the pages you’ve selected, which may lead to your review stars being shown in Google organic search results. 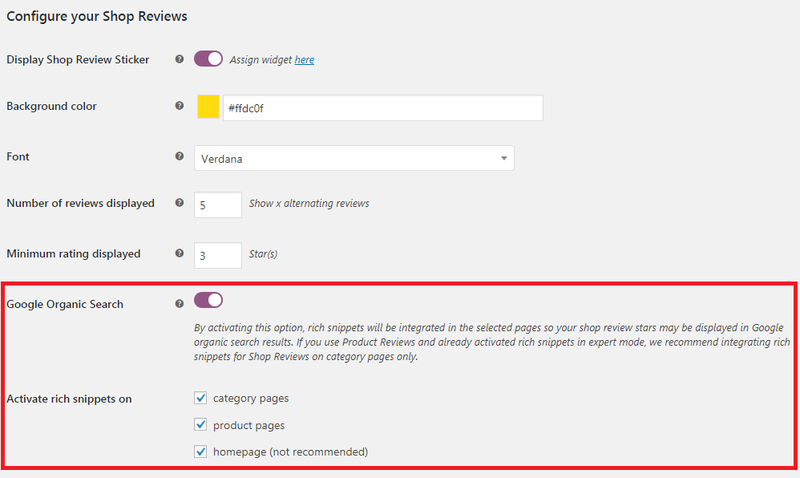 If you have already activated shop reviews or product reviews in the standard mode, Rich Snippets are already being transmitted. In this case, we don’t recommend activating Rich Snippets in the product category or product page either. Alternatively, you can deactivate them for the sticker in the expert mode. Invites are automatically sent by Trusted Shops 7 days after the order has been placed. By activating "Automated Review Requests according to WooCommerce status" you have the possibility to decide from which WooCommerce state (for example „completed“) and in which time frame after the selected state has been reached, the invites should be sent. If you want to send review requests with legal certainty, you need your customers' consent to receive Review Requests. You also have to include an option to unsubscribe. Please note: If you want to send review requests through WooCommerce, you should deactivate automated review requests through Trusted Shops. To do so, please go to your My Trusted Shops account. Log in and go to Reviews > Settings and deactivate Collect reviews automatically. In the Trusted Shops module, you have the possibility to send manual invites for orders that were placed in the past. We recommend exporting orders from the past 30 days. Download the .csv file and open it in a spreadsheet program (e.g. Excel). Split the first line in multiple columns. To do so in Excel, select the range of cells you want to split values into columns, and then click Data > Text to Columns. In the second Convert Text to Columns Wizard dialog box, only check the Comma box in the Delimiters section. Save the file. Afterwards, click the link in your Trusted Shops plugin in the section “Export orders” to continue. Log in to your personal My Trusted Shops account and upload the file you have created before. Display Trustbadge within the lower right corner of your shops or somewhere else? Deactivate responsive design? Adjust the design of Product Reviews? By using Expert Mode, you may personalise your integration even more.